When one really takes time to delve into all things festive it quickly becomes clear that it is unlikely that there will ever be an end to Christmastime culinary possibility. In fact, it turns out that it’s dreadfully difficult to keep one’s blog up-to-date with all that is being produced. The weather is the entity most at fault here, but what can one do? It’s difficult to castigate the weather – it makes a mockery of us all. Following on from my recent monologue regarding presents and the meaning of Christmas, a little gifting advice may be necessary. For those of you that weren’t aware, chocolate is always a safe bet – is there anyone who doesn’t covet one form of chocolate or another? 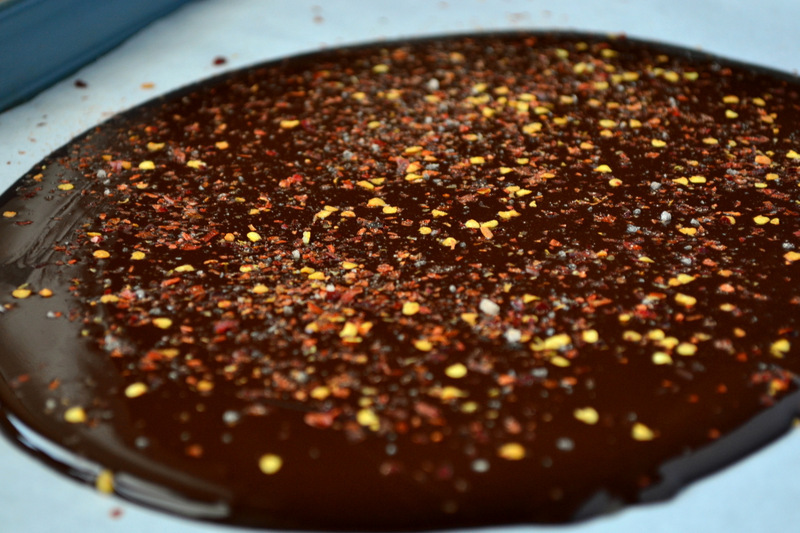 It is in this spirit that I bring you my recipe for chilli and nutmeg dark chocolate bark; it is both frugal and spectacularly delicious. Perhaps this is one case in which the old adage ‘his bark is worse than his bite’ isn’t entirely watertight. Someone get me a muzzle. Be warned, gift this bark to a child and/or teenager and you’re likely to meet with tears, violence or, at the very least, a sneer. However, adults are likely to thoroughly enjoy every facet of the sophisticated flavours on offer in this frugal bark recipe. Each bite provides sensation after sensation, with the fiery chilli hitting your tongue at first, backed up by mouth-watering nutmeg and, finally, a slight saltiness which always manages to complement dark chocolate. Now that I’ve done literary justice to this recipe for dark chocolate bark I’d like to draw your attention to my new recipe index which went live a couple of days ago. Rather a lot of you had requested such a thing, so I hope it’s much appreciated – Katherine spent a long time organising my 265 recipes into different categories! Click through to the recipe index and you’ll find a set of categories which link to a list of relevant recipes lower down on the same page, this seemed like the most helpful way in which to structure such a thing. If you have any queries or issues with the index feel free to e-mail me at frugalfeeding@gmail.com or message me via twitter or facebook! 1. Place a large mixing bowl over a pan of simmering water. Melt ¾ of the chocolate in the bowl and remove from the heat, throw in the remaining chocolate in small chunks and allow to melt. 2. Pop the chocolate back on the gentle heat and bring to a pouring consistency. Pour the chocolate onto a lined baking tray and spread until roughly 0.5cm thick. 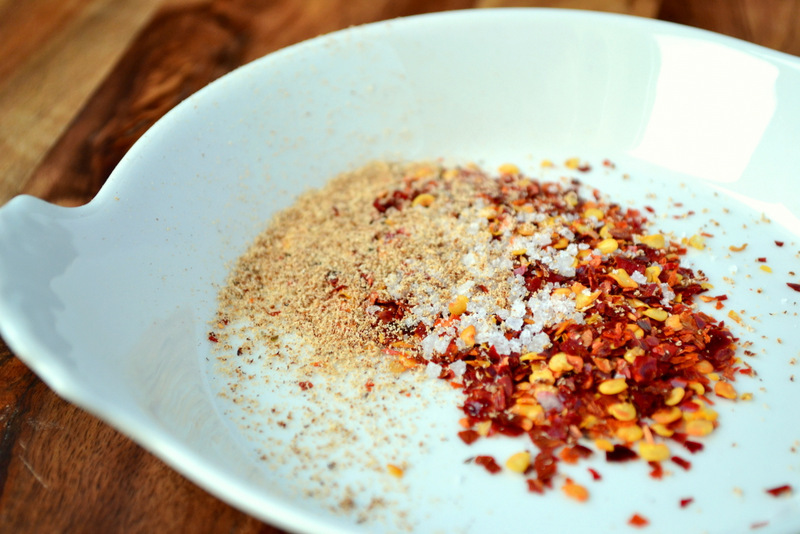 Mix together the chilli, nutmeg and salt and sprinkle evenly across the surface of the chocolate. Allow to cool completely, break into shards of roughly equal size and gift to the adults of your choice. Cost: Since this chocolate is essentially being used simply as chocolate and nothing more complicated it’s important to get a slightly more expensive, darker variety. This may not sound like advice pertaining to frugality, but if it is not followed it may result in waste and nothing is less frugal than waste! As such, the entire bark should set any want-to-be chocolatier back a mere £3, which is a darn sight cheaper than anything of comparable quality in the shops. That’s exactly what I was thinking! This would be a fantastic gift! It is going to be gifted, never fear! OH MY! This has got to be amazing! I need to try this for the holidays. I love spicy and chocolate together. You rock!! Hehe – oh it is! Me too, the salt also works very well. “Someone get me a muzzle” Hilarious! 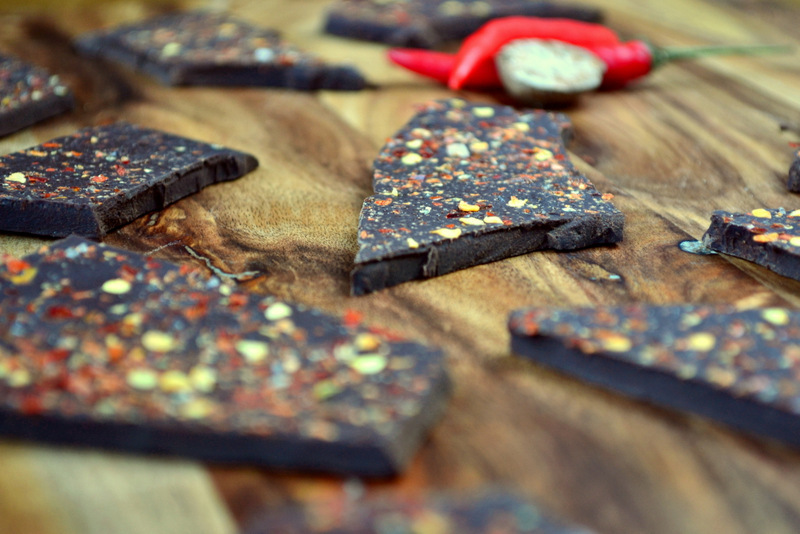 Great idea with the chilies, but I would agree that a child would not like this type of bark. I mean really, how could I ignore that line…it made me laugh out loud! The recipe index is a fantastic idea. As is the chocolate. Sounds right up Mr P’s street, so he might get some for Christmas! (Hope he’s not reading!!). Thanks! It took ages! Haha – he’ll love it I’m, sure. Fantastic – hope you enjoyed! Nick that is SO FUN!! I just love this! Pinning straight away and making, maybe with my girls, at the earliest opportunity! Thanks friend! Hehe – thanks! You should and make sure you let me know how you found it! Thanks, Marcus! I have no idea, but I’d imagine that it is… I’m so happy to have some nice wood back in my pictures. So beautiful – looks like stained glass. Just lovely! This looks really interesting….I’ve never had chocolate with chili before….can’t wait to try it! You should – it really is wonderful. What a cool combination! Looks delish! 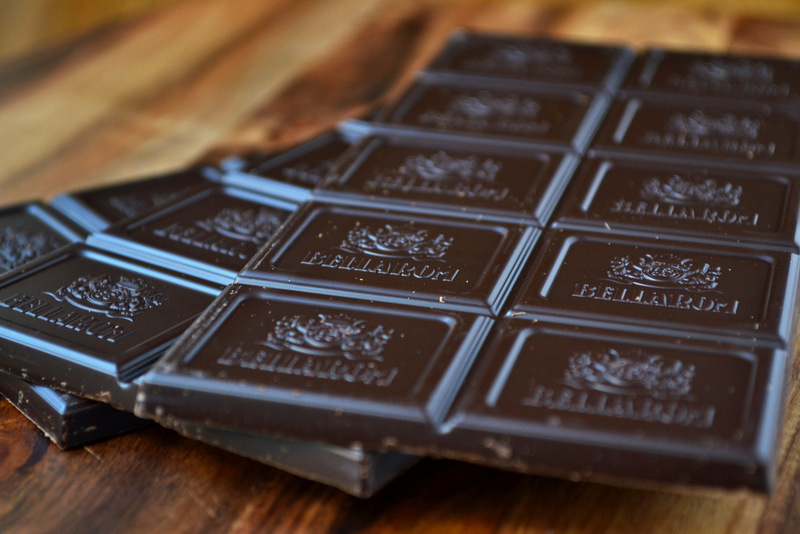 Love it, and I hear dark chocolate is good for you! This is amazing! I love the mix of ‘heat’ and chocolate – Mayan style, no? Anyway, Alton Brown’s hot cocoa recipe also requires a pinch of cayenne pepper. I really need to make some this! thank you! OH yes, Mayan! I will make this immediately. Thank you. Chillis, with or without chocolate, are my second favorite flavor. Chocolate is my first. Adding to my list of paleo goodies to try… yum! 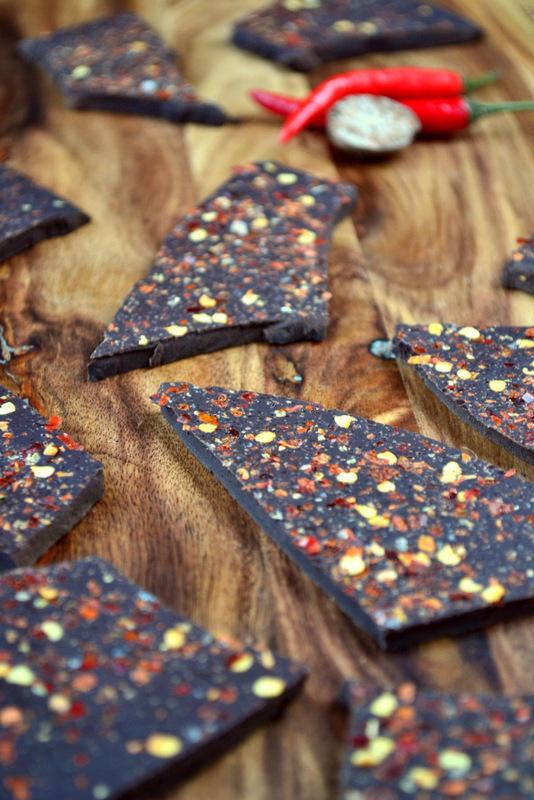 This chocolate bark looks delicious! I think I’ll have to make some for my spice-loving (thought nutmeg-hating) boyfriend. The chili flakes make this bark look so beautiful! Thanks!IT does only take 5 minutes to make! Hehe- thanks! It’s still sitting in my fridge to be gifted! Chili and chocolate = match made in heaven! this. is. BEAUTIFUL. and probably so so delicious. I am totally making some for the people who work in my apartment building, cause they’re so cool. great idea! Thanks! IT’s very simple too! amazing D:. No problem! Thanks, Merry Christmas! Wow! That is gorgeous and looks easy! I love chocolate and spice. Thanks! Thanks – yes, a classic combination! Love all the holiday posts you’ve done lately. Thanks, I’ve enjoyed making them! Another tomorrow! This is fantastic, looks exactly like the ritzy stuff sold in gourmet shops! Thanks for sharing. Thank you! Haha – more to come in the New Year too. Oh my gosh! This looks awesome! I know a couple of people who are going to love this. Making this tonight. Love the combo of spicy and sweet. Great photos too. Excellent and I bet oh so spicy-sweet! I particularly enjoy looking at the last photo with all the beautiful colors! Oh yes, oh yes! Thanks! I have to try this–I’ve had dark chocolate with nutmeg and love it…and dark chocolate and chili and love that (but then I’m a serious chocoholic anyway). This is my kind of Christmas present! I’ll send you my address :). Hehe – It’s great! Thanks so much. Please accept my kind regards without any obligation. This is my thanks for being such an inspiration to me. That just looks spectacular. Will be a winner at our place where chocolate, chilli and spice are top three flavours. Thank you! Ah yes, it sounds perfect for you. Thank you – it is indeed! To be honest you don’t really notice them as they are flakes! Salt and dark chocolate are a match made in heaven! Thanks! Thanks for putting up the recipe index – I look forward to browsing this and picking up a few ideas! 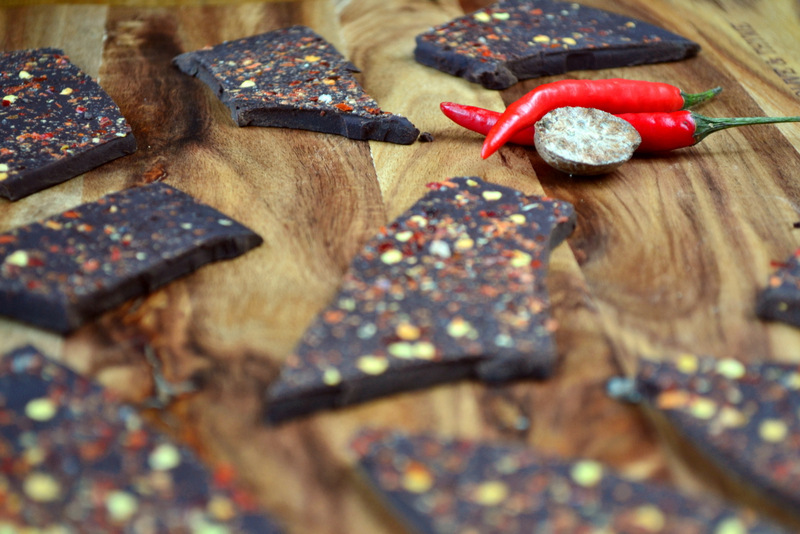 And the bark looks fantastic – chocolate and chili is a total winner for me and I am intrigued by the nutmeg! No problem! Enjoy! The bark is so delicious! I keep reading recipes for chocolate bark but have never made it myself. It looks delicious and so simple so will have to give it a go! Oh you must, Kate! It’s so far up your street I can no longer see it! I love the simplicity of bark. Your variation looks fantastic. The recipe index also looks great! Me too – very quick :D. Thanks so much. What a great idea, wish I would have thought of it! !